Today: German name, Turkish origins, northern Italian classic -- in short, a crowd pleaser. You may not think of strudel as a classic Italian dish: The name strudel isn't even Italian, but rather German. This is what makes regional Italian cuisine so interesting. The country's geography –- its borders, its landscape –- factors into the character and traditions of each region. Apple Strudel -- a dessert of apples, pine nuts, and raisins or currants rolled up in paper-thin pastry -- is the defining dish of Italy's Trentino-Alto Adige region. This autonomous province borders Austria to the north and is squeezed between the Veneto and Lombardy regions to the south. Knowing this -- and that the region was part of Austria until after the first World War -- helps explain why this Austrian favorite is also beloved in Italy. Strudel's history goes back even further, though: It was brought to Austria by the Turks (there's an undeniable similarity between strudel and the more ancient baklava). 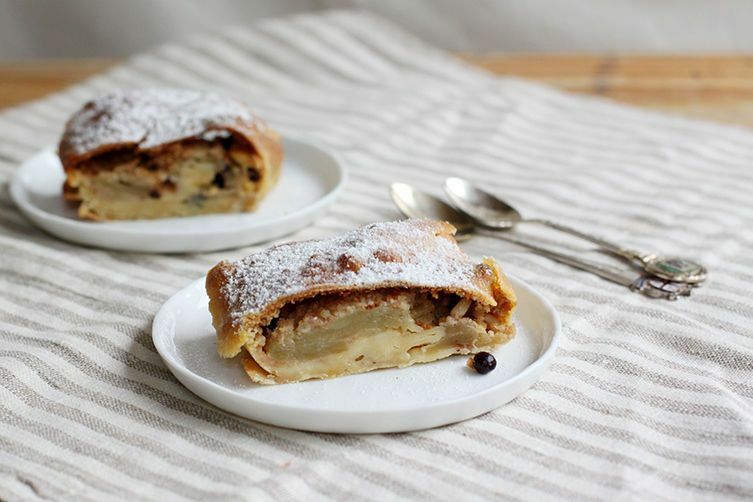 In northern Italy, such as the Veneto and Friuli Venezia Giulia regions, you can find strudel in various forms -- sometimes made with puff pastry, sometimes with shortcrust pastry. But the Trentino way is very much like what you find in Vienna: a thin, somewhat-flaky, and crisp pastry that gives way to something soft when eaten at room tempearture a few hours after baking. The main ingredients used in this beautiful, mountainous region have long been cultivated and made there: apples, cheese, and speck (dry-cured, smoked ham made from pork thighs -- like a slightly smoky prosciutto). As such, you would typically make this dessert with sweet, pale yellow Golden Delicious apples, which are grown in the region's Non Valley all year round. They're great in this dessert because they turn meltingly soft when cooked, but you could also use the more tart Granny Smith apples. In the summer, you can also use fresh apricots or berries. Despite the look of the recipe ingredients and method, this is actually a rather simple dessert to prepare and won't take nearly as long as you might think. Stop saying that its some wonderful cultural exchange going on. Südtirol isn't Italian, and any Italian-ness was forced on them by the fascist regime. The people there are AUSTRIAN, not Italian. Thats NOT Italian food. Italy has plenty, don't steal from us. So the filling tastes amazing. But I had a similar experience with the dough as someone below did. I had to keep it in the oven for a solid hour before it got browned. I thought I rolled it thin enough, but maybe not? Maybe the crust will be better when it's at room temp and little softer. But I think the filling would be amazing in a galette - pie pastry I am much more comfortable with! I don't think the browning of the dough has to do with how thin it is but it could actually be your oven temperature doesn't reach as high as it should so things can take a bit longer to brown? When it comes out of the oven fresh, the crust is really crisp and crunchy. As you let it settle, the next day, for example, it will be soft -- so it depends on which camp you're in, the crisp crust or the soft crust, if the latter you could always plan to bake this the day before you want to serve it! Thanks for the reply. I'm actually baking another one. 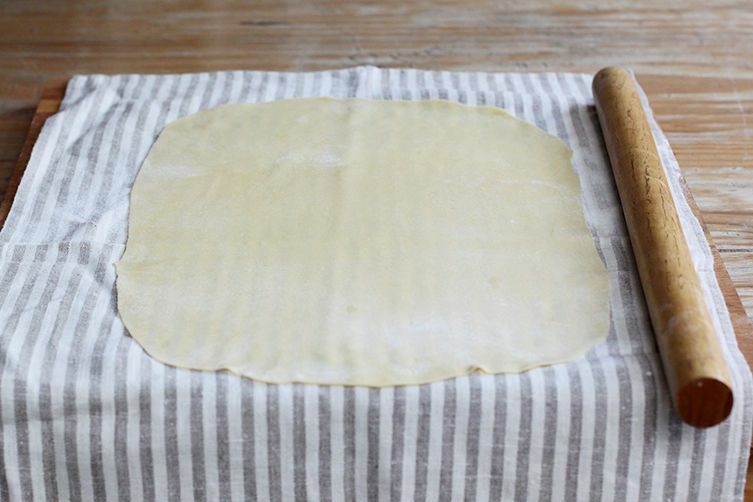 I used another dough recipe, and did what most other recipes tell you to do - stretch it on a tablecloth to get it super, super thin. Most other recipes seem to say to bake it at 400. I started it at 350 - it was still not brown at all after 30 mins - so I turned it up. Breadcrumbs? Some recipes are specific about fresh or dried, but when the ingredient list just says "breadcrumbs" I never know which kind is meant. Is there a rule? Every publication will have it's own rules but I'm pretty sure you only indicate when using fresh breadcrumbs. Breadcrumbs on it's own mean dry. I made this recipe last night, and for some reason it was a total disaster -- mostly because of the dough! I'm willing to concede that it's something I probably did wrong, but I wish I knew what. The dough was extremely elastic, and when I cooked it, it did not brown. When I finally took it out, it was a very tasteless dough that I couldn't stomach. Do you know what might have gone wrong? Elastic dough, that sounds good. Perfect actually, as that is exactly what you need in order to roll it out super thin and then roll the filling in it without it breaking. Not browning sounds like it simply didn't cook long enough (and that would explain why you couldn't stomach it, if you were eating raw or partially cooked dough!). It's meant to not only brown but be very crisp and even flaky when it comes out of the oven. A day or two later the pastry relaxes and softens (and is even better this way, but depends on how you like it!). 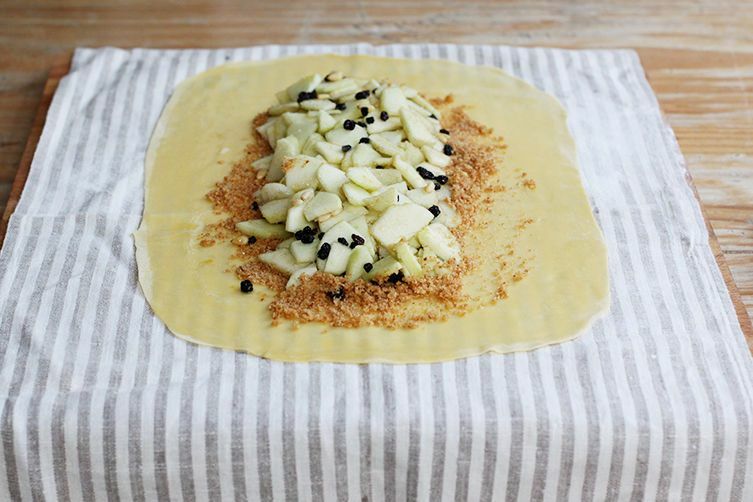 This is a really standard recipe for apple strudel dough so I think it just sounds like you maybe needed to cook it longer -- ovens tend to vary wildly so it just be that yours needs more time! 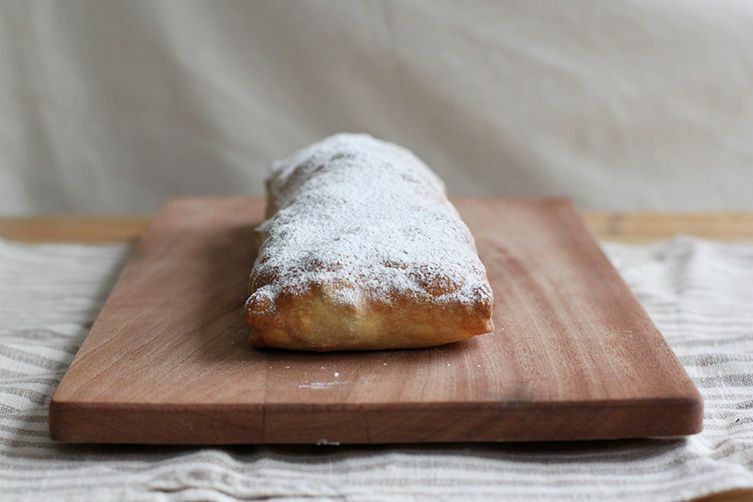 Looks a lot like my great-grandmother's strudel (she was Slovenian). No pine nuts in hers tho'! I might have to make both and compare!! Thanks for sharing! Yes I've heard that about the Austrian and Slovenian strudels. Pine nuts are a very Italian addition! Love your step by step photos. A few questions. Can the dough be made in a stand mixer with a dough hook? And do you think freezing half of the dough would work if I wanted to make only one strudel? Lastly, what kind of breadcrumbs - fresh or the prepared from the store? Thanks. I find this dough so easy to mix by hand but yes, by all means, you can use a mixer. Freezing dough works, you should let it come fully to room temperature before using (take it out the day before and you can thaw it in the refrigerator for 24 hours then leave it out on the counter an hour or so -- or quicker you can leave it on the counter directly). For breadcrumbs use just dry, fine ones (store)! They say it was brought over during the Ottoman Empire. Think of it as a distant relative (changed over the centuries and because of seasonal/cultural tastes) of baklava! Well, that makes a sense :) I am not a huge fan of baklava, its too sweet for me; but I love fruit desserts. Might try the recipe this weekend! Unlike baklava this isn't a super sweet dessert either (there's only 1/4 cup turbinado sugar in the whole thing, so that's 1/8 cup sugar in each strudel!). It's mostly the fruit that sings out! Pine nuts are a really typical Italian addition to desserts, especially when combined with raisins or currants! Is there a recipe for the cheese and speck version? Can you explain the use of breadcrumbs in the filling? They soak up the juices from the apples. Otherwise you would have a runny, soggy strudel. They are are pretty much undetectable in the finished product. Exactly as Alisa mentioned -- they are to ensure the pastry remains crisp. They become soft as they soak up the juices from the apples so, as Alisa says, you cannot detect them -- and they also give a little more body to the filling too! This looks so delicious Emiko! !